In an attempt to sway bettors in their favor, barn opponents alleged it had no deterrent effect. However, that belies several examples of success from the security barn. The most glaring was the case of a trainer known for winning at a high percentage at every venue. The instant the security barn opened this person’s New York success fell off the table. The stable continued to win 25 percent everywhere else, less than half that in New York. In the past four years, the New York entries from this barn have been fewer than half the number from the final five months of 2005…. This outfit has had ZERO New York starters in 2010. There’ll be more stalls available at Saratoga this summer, and fewer complaints from horsemen year-round. 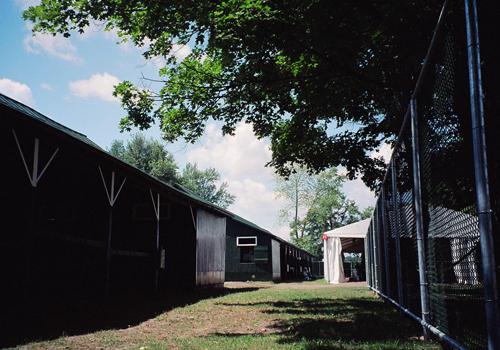 NYRA announced today that, five years after the detention barn opened, the secure area has been closed, to be replaced by random out-of-competition testing and other security measures. “Horse-friendly” is definitely one thing that can’t be said about detention. That horse left his race in the barn, and he wouldn’t be the only one to do so. now let’s get Zenyatta out here! One last post about Zenyatta or Rachel Alexandra (for a couple days, at least), as I can’t help noting that the reasons both trainer John Shirreffs and owner Jerry Moss are giving for ruling out shipping the mighty mare to New York for a race at Saratoga or Belmont is the detention barn and Giacomo’s meltdown before the 2005 Belmont Stakes. Interesting how they’re citing the one thing that makes NYRA tracks different, just as Jess Jackson did with his mentions of Curlin’s Breeders’ Cup Classic loss and the Santa Anita Pro-Ride when he said Rachel Alexandra was unlikely for the Breeders’ Cup. Excuses to duck? Or legitimate concerns for both camps? It doesn’t matter if Mullins made a mistake, as he claims. The NY rules are clear, Mullins brazenly violated the whole point of the detention barn, and he should be disciplined. But reaction in some quarters has been disproportionate, [making more of what happened than early reports indicated,] and yes, insinuating. I remember the Van Berg incident; hysteria didn’t follow. The same sort of perspective should prevail now. That it’s not, I take as a pretty good indicator of how broken racing is when it comes to drugs and enforcement — much of the breathless, Mullins-had-a-syringe! response seems rooted in a general dislike of the man himself and a desire (understandable, I also share it) to see the racing industry get tough and get rid of people who think the rules don’t apply to them. People are fed up, and here’s a convenient punching bag. And that’s it from me on Mullins, until new developments arise. 11:30 Addendum: It just occurred to me, [maybe] Mullins is to integrity as Eight Belles is to safety. It matters not what actually happened, or how it happened — that something happened is enough to galvanize change.